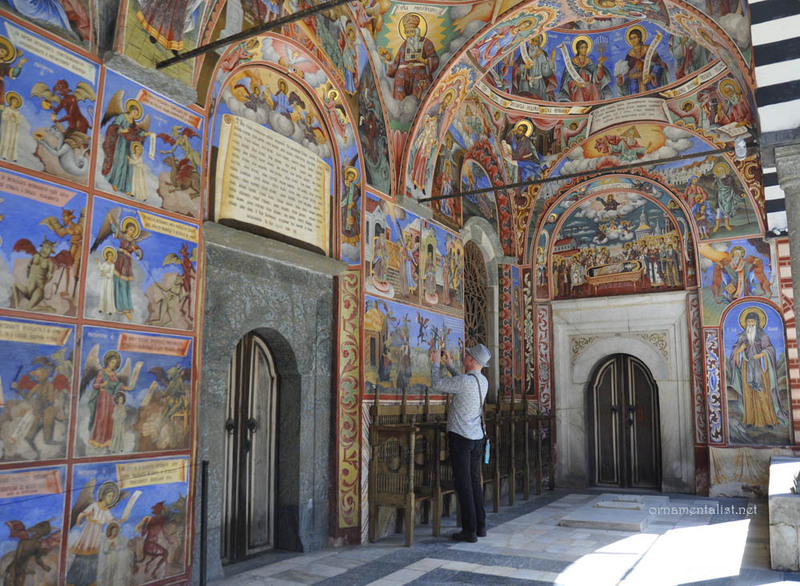 One beautiful and very hot day in June, we visited Rila Monastery, in the mountains 117km south of Sofia, Bulgaria. And I had my camera with me. Rila Monastery was founded in the 10th century by the hermit St Ivan of Rila, who lived in a tiny cave in the hills above this site. 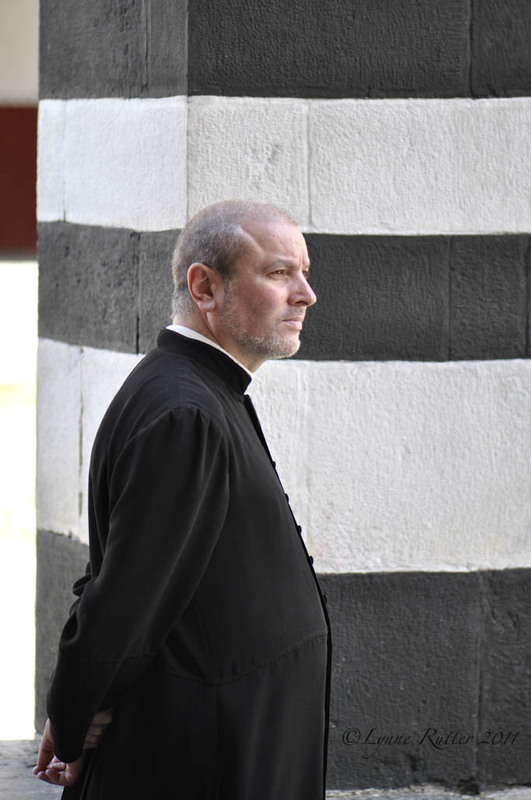 The monastery was built by his students, and over centuries grew to become the largest and most important center for religious and cultural activities in the country. 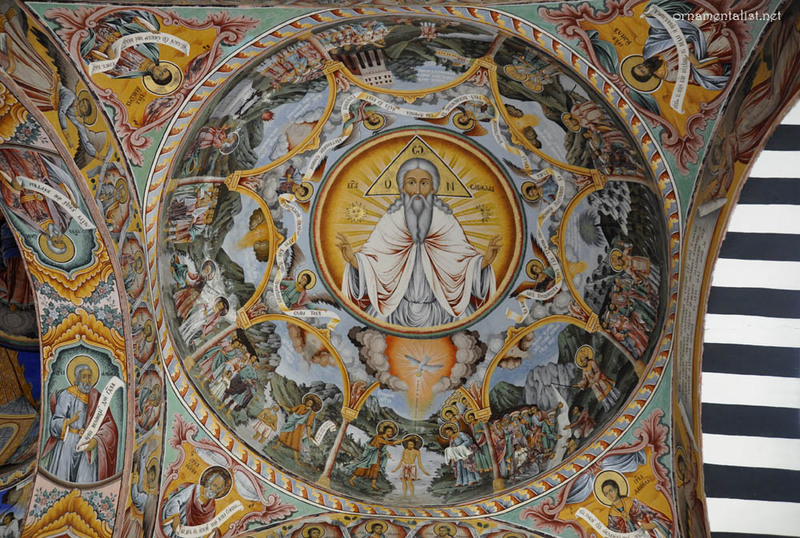 During the Ottoman Empire rule of Bulgaria 1396-1878, the monastery took on the role of bulwark of the Bulgarian cultural identity in the face of foreign occupation, and a destination for pilgrimages from all over the Balkan region. We hired a driver for the day because I heard heard the bus trips don't allow much time to visit before you must to return to Sofia. When we arrived in Rila our driver offered to come back in one hour to pick us up and take us to another place. I showed him my camera and shook my head. Just leave me here. Come back tomorrow maybe. Erling laughed, and offered to call the driver sometime before dark. My Ornamentalist Enabler. In the 18th and 19th centuries, Bulgarian culture and identity enjoyed a renaissance during the National Revival. 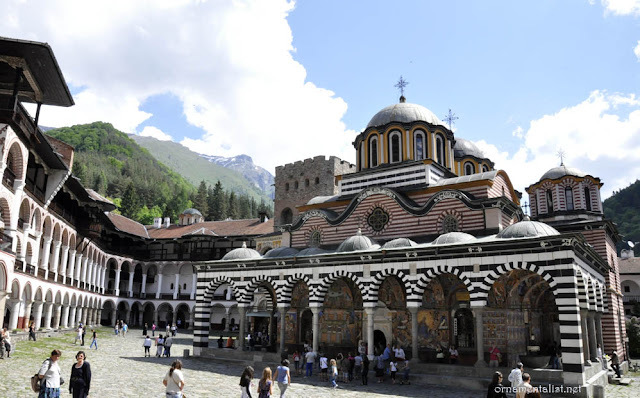 During this period Rila Monastery was destroyed by a fire, and rebuilt as we see it today, using a design typical of the Revival style of architecture and decoration. Surrounding the church at the center of the courtyard, is the pleasant, four-story high residence of the monastery, decorated with simple painted designs in black and white and red, in geometric and floral motifs. 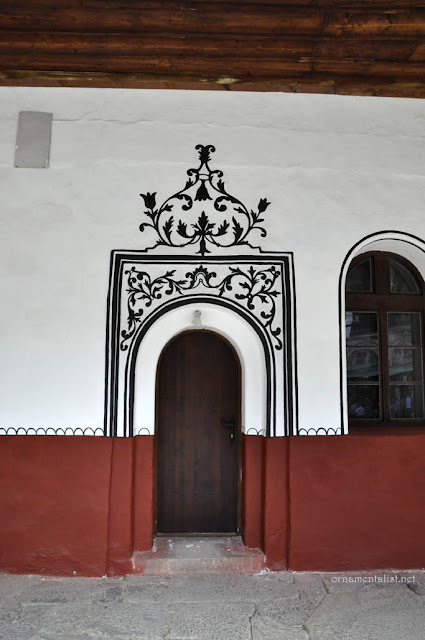 These areas reminded me of the old mission churches in California. 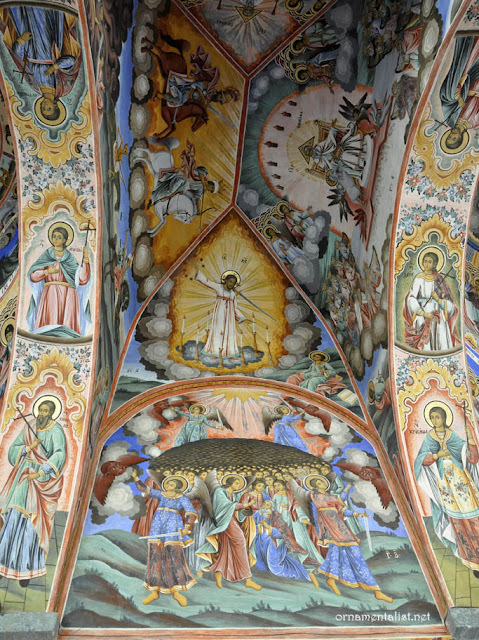 The domed porch surrounding the church is painted with intensely colorful frescoes, which have been recently cleaned and restored and really glow. I could almost hear and feel the color. Especially that blue. 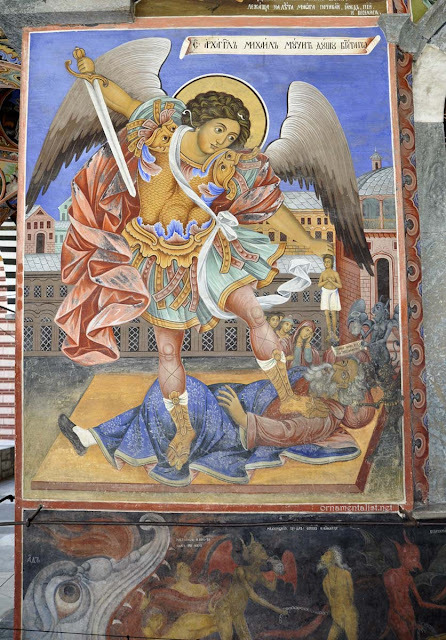 Every surface is covered with scenes of stories from the bible painted in pure, vivid hues. 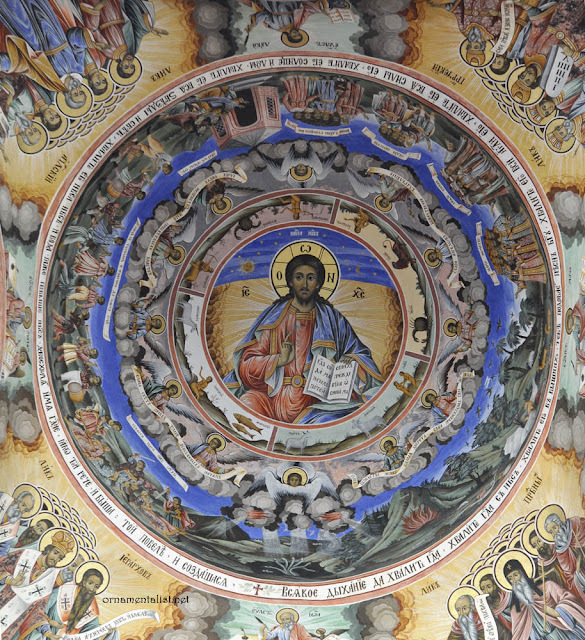 Completed in 1846, the frescoes are the work of the famous Bulgarian muralist Zahari Zograf and his brother, the icon artist Dimitar Zograf, as well as many master artists from the schools of Bansko, Samokov and Razlog. 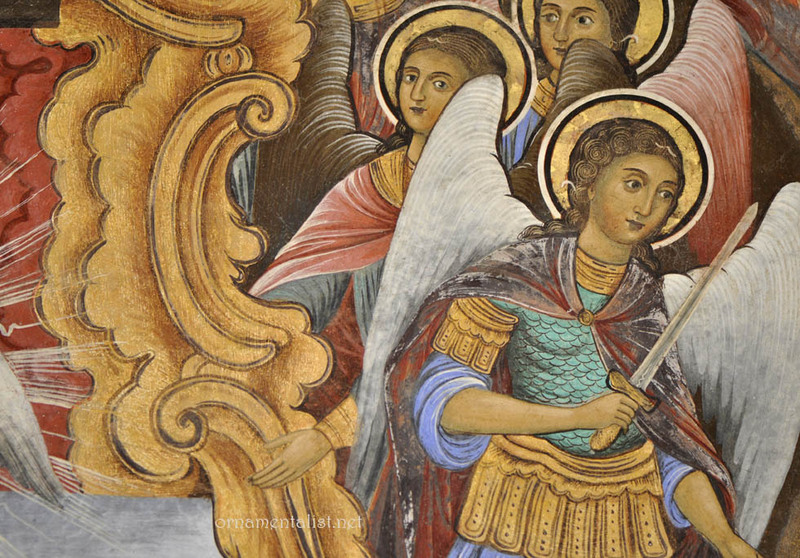 Orthodox art observes a rigid standard of stylistic representation of sacred figures. In between these iconic scenes however, are moments of decorative brilliance representative of the Bulgarian revival of folk art. 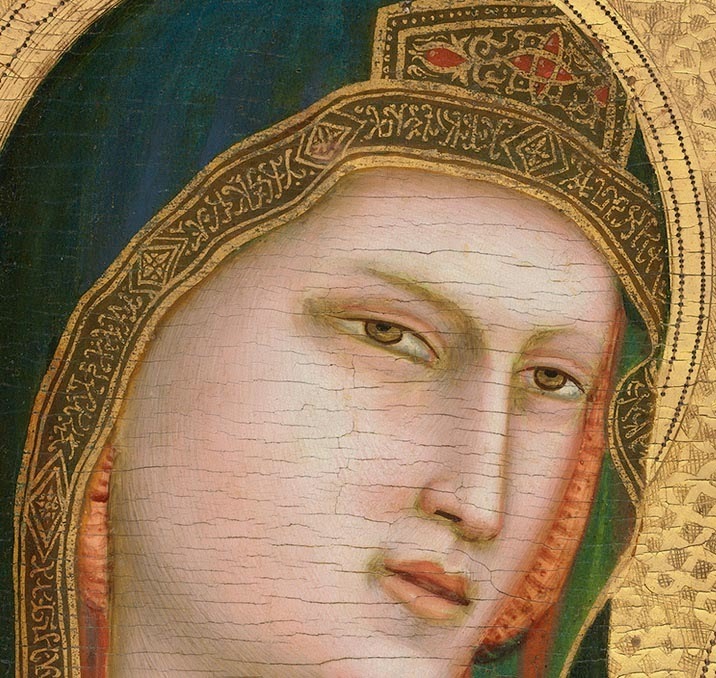 The palette is pigment-based and uses some lovely combinations of gold and green, blue and red, rose and brown. In some places one of the red pigments has turned black, possibly due to exposure, or from a chemical reaction to the fumes from gas lamps that had been in use in the past. I spent well over two hours studying the porch frescoes before taking a break and enjoying some Bulgarian donuts and a stroll around the rest of the grounds, visiting the museum and touring the enormous monastery kitchens. The inside of the cathedral was under restoration but still breathtaking, with an iconostasis [by Athanasios Taladuro of Thessalonica] a spectacular, intricately carved and gilt wall of icons. Erling and I returned to the porch where I got out my 105mm lens and had another long look the frescoes and discussed their meaning. Later we reconnected with our friendly driver, who took us up the mountain to the 1/2 mile trail that leads through the most beautiful woods to the small cave where St Ivan spent his ascetic life. The Monastery of Saint Ivan of Rila is UNESCO World Heritage site which receives nearly nine hundred thousand visitors each year. It is still an active monastery and a pilgrimage site. There are volunteers inside the church who will give you a green cloak to wear over your head and shoulders if you are not modestly attired. I always travel with my own scarf in case I need to cover my head in the church, mosque, or temple I am visiting. One of the priests was keeping a dignified watch over the area to make sure the younger tourists behaved. I showed him my camera monitor after taking this picture and asked his permission to use this photo. In this post I wish to express my profound gratitude to my teacher and mentor, Dr. Otto Mower, with whom I traveled to Bulgaria in 1980 on my first visit to Europe, as part of a study tour of art history. That I became a decorative artist was in large part due to his influence and encouragement. Dr. Mower passed away on February 7, 2012. What a treat to find this morning! That banded courtyard is beautiful. Looking at the last photo tells me at least some of it is painted banding and not marble? That fresco shot with Erling is priceless! The color is so pure! Nice post. Theresa, there is some stone on the floor and the door surrounds, but everything else is painted plaster. The bands of "bricks"on the church- these are also painted! 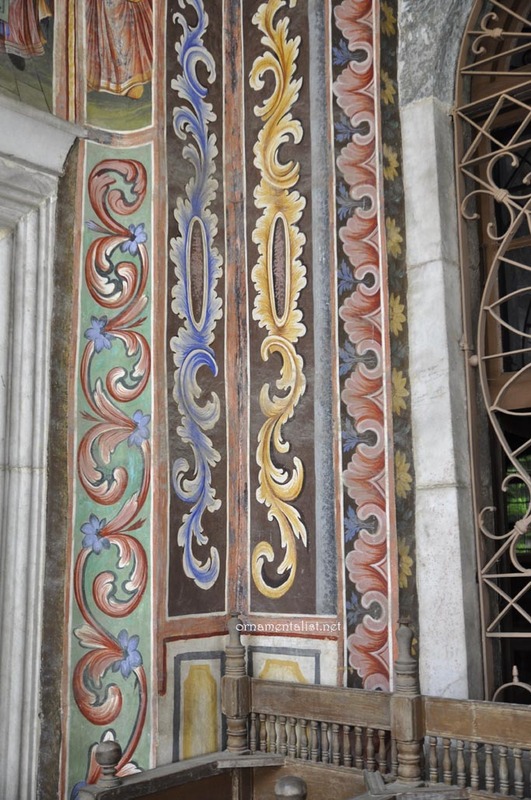 Lynne these frescoes are truly stunning works of art! I am so glad they have been cleaned and restored. Those colors! That pure blue! Gorgeous! I'm so glad I found your blog. So much beauty to drool over. Thanks! thanks Carla, so nice to have you here! Drooling over all the pics. Happy you found a way to spend as much time as possible to see the work! 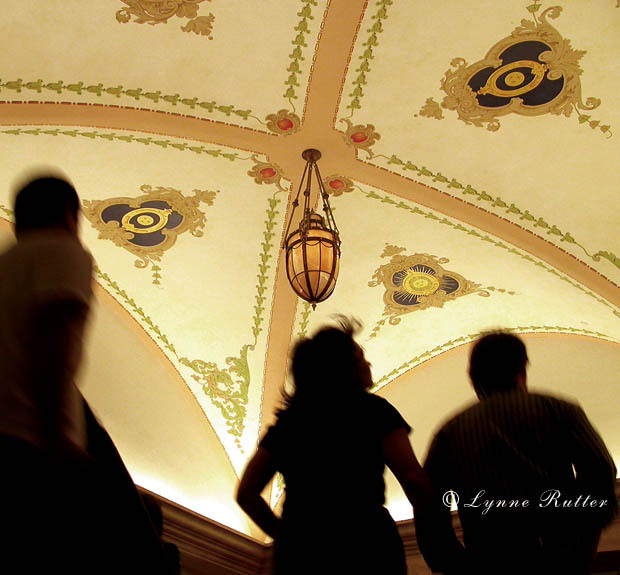 Hi, Lynne - Thank you for sharing this trip. I really like the intense colors, and especially that luminous blue. The colors and repeating panels remind me of some Ethiopian religious art I've seen. I'm intrigued by the blue elements on the Archangel Michael's armor. I wonder to what that alludes? I'm going to stick my art history neck out here and say there is a strong connection between Ethiopian Christian art and Eastern Orthodox painting- I think they both observe many of the rules of Byzantine art.